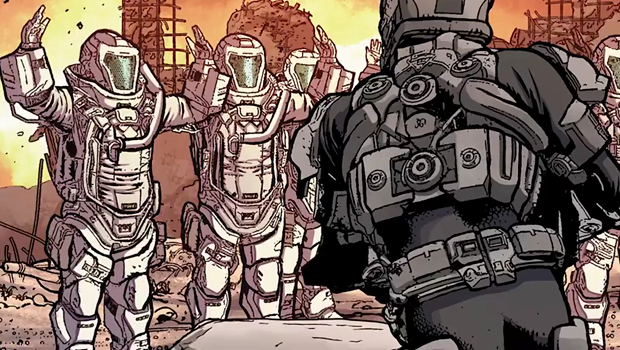 Yesterday, Titan Comics released a teaser trailer for its upcoming comic series, Robotech #1. The ongoing series will be released on July 26 in comic stores. An adaptation of Harmony Gold’s 80s television series, the comic will include all-new adventures written by Brian Wood (DMZ, Briggs Land, Northlanders), with art by artist Marco Turini. Whether you’re new to the series or ready to get back to Macross Island, Robotech aims to bring back the nostalgic action of the 80s into a monthly ongoing series. Check out a few interior pages of the first issue below! Robotech #1 will be available on July 1 in comic stores. Stay tuned for more news here on Gaming Trend.